Many years ago, 20 years after the war in Vietnam had ended in 1975, a middle aged gentleman walked into the office of William H. Singer, Ph.D. a psychologist located in Redmond WA. This gentleman informed Dr. Singer that he was very depressed and had been considering suicide. He proceeded to express what he had experienced and what had that caused him to feel this way. This was a story that would never be forgotten. His story etched itself into Dr. Singer’s mind and became an all-consuming fire, which he could not extinguish. He sat down on the office couch; a rather distinguished businessman who at first glance, and even under careful scrutiny, would never be thought of as being “depressed,” and surely not “suicidal.” He spoke in a quiet and subdued tone, looking directly at Dr. Singer with his piercing blue eyes, over frameless glasses and began his story. As his chopper descended into a “hot LZ” (landing zone) to pick up troops on the beach during his final tour in Vietnam, he described seeing a blue tarp on the beach and as the rotors of his helicopter blew the tarp away, there on the sand, lay the body of a young boy. He said that this image was inescapable and the thought of what he described as “this beautiful, dead young boy”, was a daily reminder that he was still at war. After 42 years of clinical practice, his story was one of many Dr. Singer had heard over the years, and one of the mainstays of his practice, became helping combat veterans return to civilian life. Over the years, Dr. Singer heard and saw their pain. He listened to their brutal experiences, helping them return to the semblance of normalcy, and a desire to continue to live and create something positive from the horrors of war they had experienced. Then a “new wave” of young men and women started to come see Dr. Singer after the Vietnam War had ended in ’75. They came home from “Desert Storm.” They came with the same horrors that stemmed from a different kind of war, nonetheless just as brutal and bloody. These Vets continued to take Dr. Singer to war with them, reliving their pain and agonies. “I sat with them as they wept; these young men and women who did not know the true meaning of war, until they were in the midst of death and dying” said Dr. William H. Singer. And then came yet another war when our young men and women went to fight on the foreign soils of Pakistan and Afghanistan after 9/11. Those who survived and returned to civilian life, once again, returned to fight the war in their minds and the war of reintegrating into civilian life. Whether these veterans had served stateside or overseas in combat, they found themselves displaced after their military service. They had no jobs, despite their skills and training. They had no real understanding or support from social service organizations or society in general. They were expected to return to civilian life and carry on as if nothing had ever happened. “Helping these young men and women one by one seemed so minimal and frustrating…if only I could reach more of our vets to help on a larger scale, that would reach more lives and possibly save more lives than one at a time…vets who were unemployed, vets who were homeless, vets who did so much for us in the service of our country, yet were despondent and so hopeless to have become suicidal” stated Dr. William H. Singer, Executive Director of the NAFC Not Forgotten Foundation. Dr. William H. Singer, co- founded a Foundation that would help special needs populations based on the stories he listened to throughout his years as a Psychologist. These men and women had a profound impact on him and he could not think of any more deserving population that were in need than our Military fighting for our country and then fighting to return back to civilian life. Many military personnel struggle adjusting to everyday life and finding meaningful work. They yearn for the ability to overcome their PTSD/depression, find purpose and careers where they can put their skills to use, and the ability to help others. The fitness and wellness industry is in desperate need of qualified fitness professionals to meet the growing health issues that we face today (330,000 Personal Trainer jobs, alone, are forecasted by 2026). According to the Centers for Disease Control and Prevention (CDC), nearly 900,000 Americans die prematurely from heart disease, cancer, chronic respiratory disease, stroke, and unintentional injury every year. Additionally, 20 to 40 percent of those deaths are preventable. 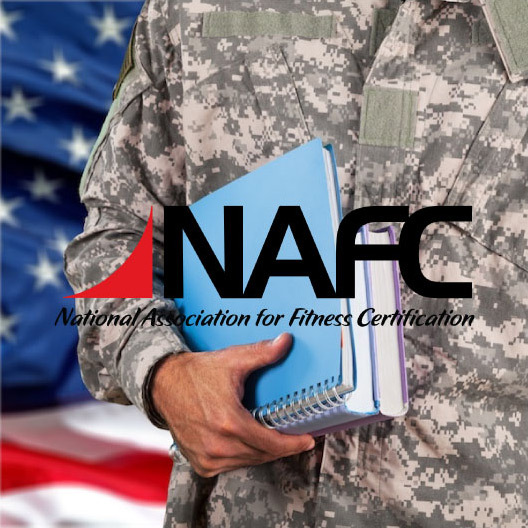 NAFC has dedicated itself to raising the bar on health, fitness, and wellness education, training, and full time career development. NAFC’s “Not Forgotten Foundation” celebrates the compatibility between our transitioning military personnel and the growing need for health, wellness, and fitness professionals. By NAFC’s “Not Forgotten Foundation” providing fitness and wellness education, along with training and assistance from a personal Career Management Specialist assisting in career placement, each of the scholarship applicants will be able to build a stable and meaningful future for themselves and families. “Fitness has provided me an outlet for a number of things, which includes my suffering with PTSD. I would love to be able to help others who struggle like myself.” stated Joe Williams (U.S. Army), an NAFC Not Forgotten Scholarship recipient. ARE YOU A VETERAN: See NAFC Military Scholarship https://www.nafctrainer.com/military. Sports and Fitness Insurance is proud to support the NAFC Not Forgotten Foundation. HOW CAN YOU HELP: Please visit NAFC Not Forgotten Foundation https://www.nafcmission.org.